In our first rare whisky review of 2017, what we’re seeing is continuation. One – there looks to be little slowing in the increase in values for the right bottles. Two – the number of fakes in the market is increasing. Looking to Scotch Whisky Auctions, we saw a new record for the third release of Black Bowmore. £7,400 sealed the bidding at £400 ahead of Bonham’s previous December 2016 high. Looking back just under twelve months and the price was £5,150. Take it back to February 2014 and the price for this bottle was £3,500. Amazingly in 2008, these were selling for £1,400. This buoyancy provided ample opportunity to re-run the Black Bowmore Index which we last published in August 2015; some eighteen months ago when the index stood at 294.25. That was impressive enough, however, we’ve seen a further 57.14% increase since then, with the index now standing at 462.39. From a monetary perspective, the £ cost of the three first releases of Black Bowmore at the start of the index in 2008 was £4,520. That cost has now risen to £20,900. 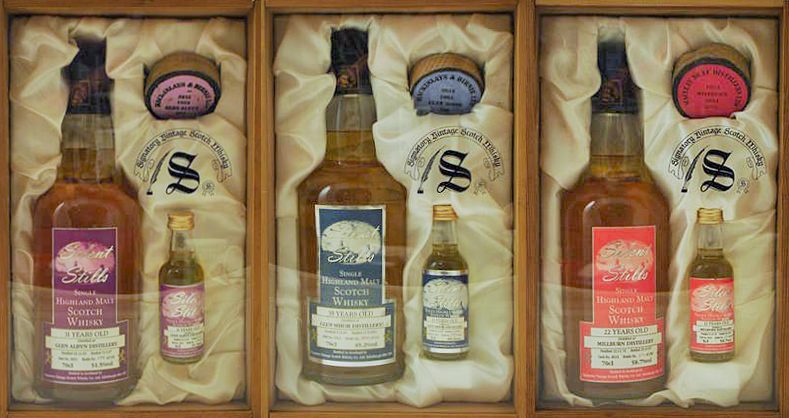 Last years release of the 50-year-old Black Bowmore completes an impressive five-bottle set. Values should remain buoyant for these in-demand rarities. Noting there can only ever be a maximum of 159 full sets of five bottles (159 bottles of the 50 were released), expect fireworks if all five ever make it to auction as a collection. The fourth Black Bowmore also set two record sales in February; Just-Whisky pipped Whisky-Online Auctions by a fractional £25 to take the highest price paid to £10,125. Not wanting to leave White and Gold Bowmore’s out, Whisky-Online Auctions sold a bottle of each earlier this month for an equal £6,100 per bottle – both new record prices. Assuming the full £16,000 retail price is paid for a 50-year-old Black Bowmore, all seven bottles of the-colours-of-Bowmore collection would cost £59,225. Bargain!!? Not content with selling the most expensive bottle of whisky sold at a UK auction last year, London-based Whisky.Auction now hold the title for selling the most expensive bottle of Macallan sold at auction in the UK. £41,000 was the magic number required to secure a second release Lalique decanter. Having been up close and personal to a few of these in my time, I might suggest that the postage would possibly cost as much as the bottle! It’ll be fascinating to see what the full set of Lalique’s (pictured below) sell for on the 2nd of April at Sotheby’s in Hong Kong. The set (in a Lalique made cabinet with some F&R mini’s for good luck) is the only one in the world released by the distillery, so with enough avid (should that be rabid!) Macallan collectors out there, I don’t think the HK$2,000,000 – HK$4,000,000 (£207k – £414k) estimate will be too much of a challenge. In fact, I’d be very surprised if the upper estimate isn’t burst by a significant margin. My drinks cupboard looks nothing like this… nope, nothing at all… Sadly! Recently, Springbank seem to be getting the attention they rightly deserve for rarer examples. 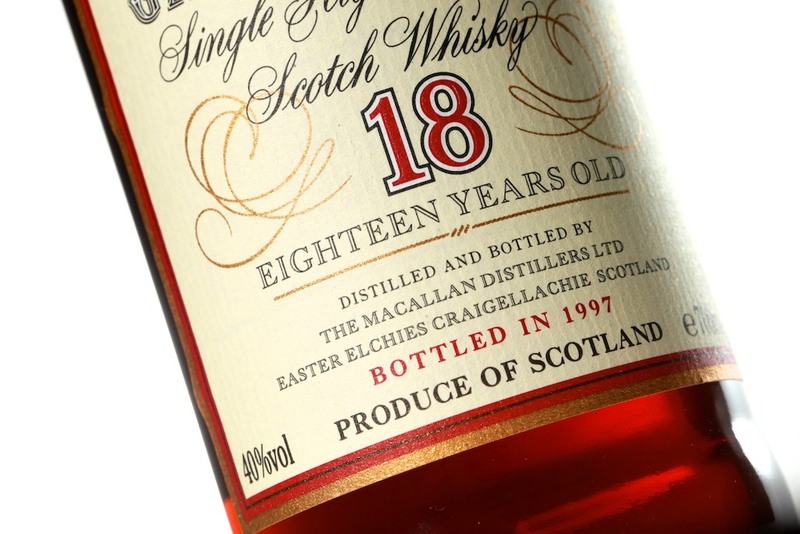 A long discontinued bottle of 12-year-old 100 proof managed a phenomenal £1,300 at Scotch Whisky Auctions – exactly ten times the £130 price-tag it was selling for in 2008. Just-Whisky took a bottle of Glenmorangie 30-year-old Oloroso through £1,000 for the first time when one sold for £1,030. As recently as June 2012 these could still be picked up at auction for sub £200. Breaking £1000 for the first time. Moving onto the second issue, we’re still seeing an increase in fakes on the market. Our view is still very clear on this, as values remain so buoyant, we will see an increase in the number of fakes. We were speaking to fellow fake-haters, Scotch Whisky Auctions, today as some fakes had slipped through their (very tight to be fair) fake-net. The two blue label Macallan 30’s were a point of discussion as one was 100% fake, the other we’re 99% sure is fake (that’s sometimes the issue with imagery, we’d need to see the bottle to be 100% sure). Challenges ahead for the market as fakes increase. There was also a really good (by that I mean hard to spot) fake Macallan 1979 Gran Reserva as well. Between the blue label 30 and the Gran Reserva’s (we’ve seen ALL vintages of these faked) these are among the most faked, high risk bottles out there… and they’re not cheap so we’re not expecting this flow of fakes to be stemmed anytime soon. It’s great to see that Scotch Whisky Auctions are taking an even tougher stance on fakes and are now barring sellers who are repeat and deliberate offenders. Clearly Scotch Whisky Auctions have done/are doing the right thing for their buyers too by refunding payments and taking bottles back. The interesting thing is that all these bottles sold for their current market value, so there’s a real education piece required to help buyers understand how to spot these things. But there-in lies the conundrum – if everyone knows how to spot fakes, fakers will correct these errors and get better. That said, we’ll be doing a lot more on this with many others later in the year. More on that later. In summary, fakes aside, the start to 2017 looks positive. We’re certainly not expecting a mirror image of the gains seen in 2016 but demand still seems to be vastly more than supply can provide for. Early days yet and there’s still plenty of time for the arrows to start pointing down but we’re not seeing significant stress in the market for now. Cautious optimism is the phrase of the month here. Bowmore imagery courtesy of Whisky-Online Auctions other than the 50 yr old. Macallan Lalique set image courtesy of Macallan. Glenmorangie image courtesy of Just-Whisky. Blue label Macallan 30’s image courtesy of Scotch Whisky Auctions. 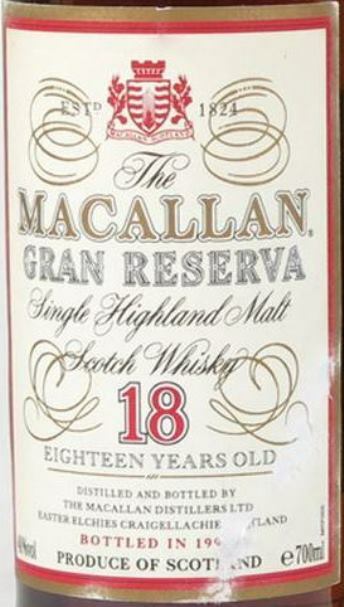 Fake Macallan Gran Reserva 18 Year Old – What’s in the Bottle? 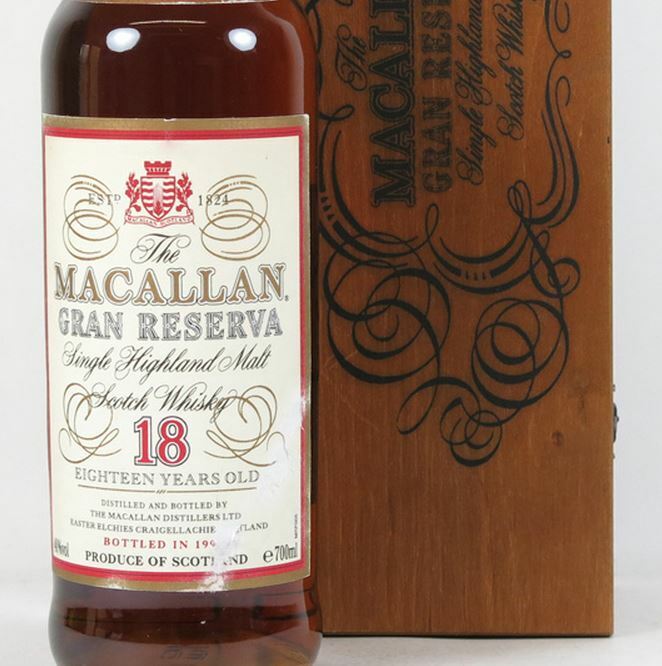 Some time ago we posted up some images of a fake bottle of Macallan 18 year old Gran Reserva. The bottle had been auctioned at Perth based Whiskyauctioneer.com (WA). As soon as the auction-house realised the bottle was fake they cancelled the sale and all was good in the world of rare whisky again. The right thing was done by a responsible auctioneer who take fakes very seriously. The big problem is, much as all reputable auctioneers would like to destroy the bottle and remove it from the market, legally, they cannot. The offending item has to be returned to the owner who can choose whatever they wish to do with it. Probably list it on ebay in some cases, in others something far more interesting. On this particular occasion the owner did something brilliant. They agreed the bottle could be opened and the contents, at least to some degree, analysed. Thanks to Whiskyauctioneer.com we managed to obtain a 20ml sample from the full bottle. The team at WA described the contents upon nosing the full, open bottle as “a bit funky”. A descriptor we would wholeheartedly agree with. Without sending the sample for a pile of chemistry doing, we too, assessed it organoleptically and measured the alcohol content with our faithful portable alcohol meter… affectionatley known as ‘Scooshie’. Even upon the full bottle being opened, you could smell far more grape than grain in the bottle. After nosing the sample in detail we came to the conclusion this was indeed some sort of whisky (most likely a cheap blend) diluted with cheap, dark sherry to give a very good colour match. There was clearly some ‘bite’ and a far higher level of alcohol than simply sherry on its own. Just imagine the damage these things could do to a brand if it’s not spotted as a fake and the gets consumed in the (false) knowledge that this is the real thing? Scooshie confirmed what we thought when she told us (accurate to within +/- 0.2% ABV) the liquid was 34.77%. 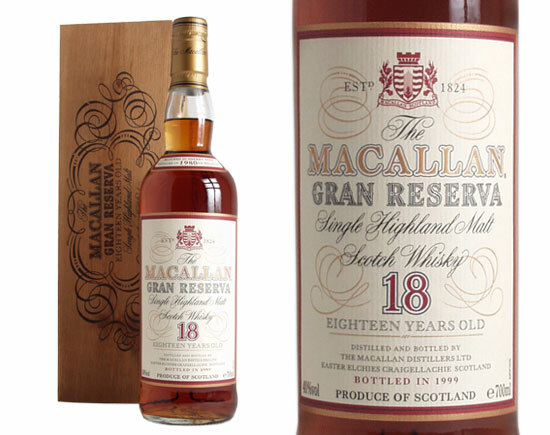 So if you have a massively burning desire to explore what cheap supermarket, own brand, bottom shelf, blended Scotch tastes like when mixed with cheap dark sherry… go on ebay and buy a bottle of Macallan Gran Reserva! Over the years, I’ve been stopped by the police and breathalysed… maybe twice. Had I failed to give a sample of breath at the roadside, I would have committed an offence. I would have been banned from driving and no doubt given a hefty financial penalty too… The assumption of non-compliance is clearly guilt. I agree with this stance. Working within an industry where a ‘normal’ day could be sampling up to 200 separate single casks of Scotch, I ensure whenever I get in a car, I’m in no way impinged by what I do for a living… AND before Mrs S. asks… No. I do not drink for a living! So by virtue of non-compliance, guilt is assumed. 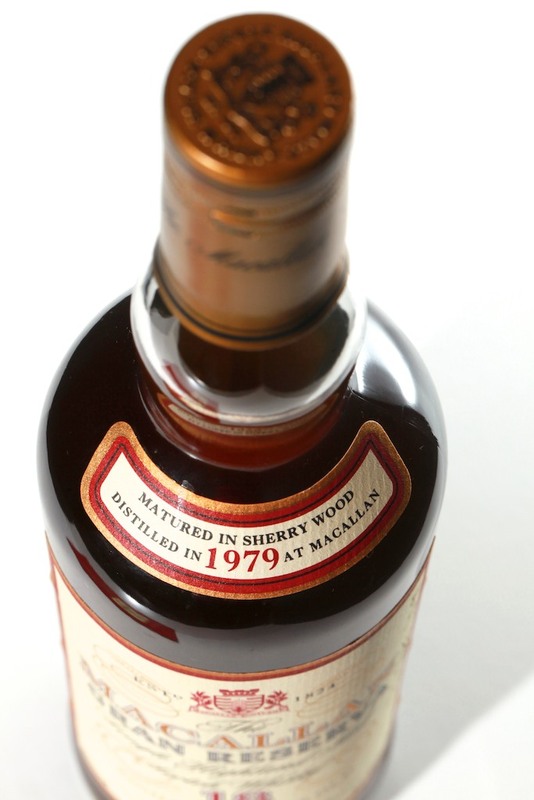 Bonhams recent whisky auction had a multitude of rare and old vintage Macallan in it. I had more than one tip-off that many of these were potentially fake. Would they be auctioned? Would some of these potential fakes come to market from one of the most respected whisky auction houses? I wrote to Martin Green (Bonhams whisky specialist) who put me straight in touch with Bonhams PR department. The initial response received was “If questions are raised about any lot – for whatever reason – we always withdraw it as a matter of course for further investigation. That is what we did in this case”. It appears there was just cause for concern and there were so many bottles withdrawn. After further email correspondence with Bonhams, the quote – “We have conducted further investigations and as a result will not be offering the bottles in a future sale” seems to confirm, something was wrong. While there was no 100% concrete “these are fakes” quoted by Bonhams, by way of in effect not giving a sample of breath, does one assume guilt. By guilt, I mean do we assume these are fake? The non-inclusion of these bottles in future auctions shows Bonhams are clearly concerned about the provenance of these old Macallan’s. What we also don’t know is if these bottles have been returned to the vendor? Will they see the light of auction again? Sent to a less thorough/less well known auction-house to be sold to unsuspecting buyers? Who knows but one thing’s certain, extreme vigilance is needed at the moment, especially when buying old Macallan bottles. 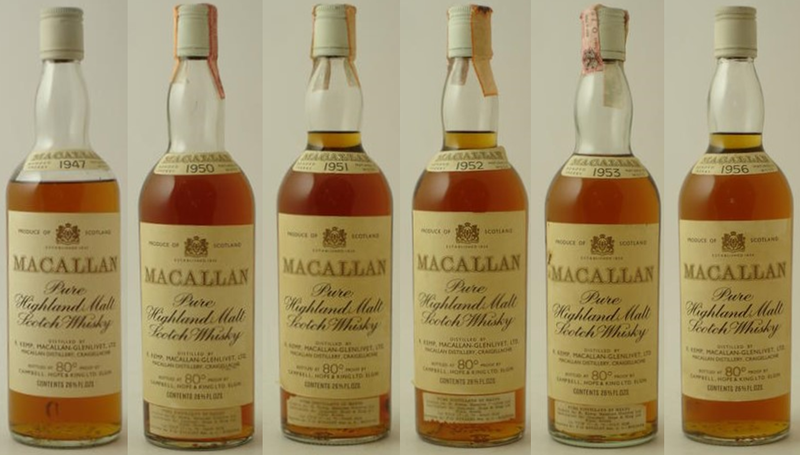 Putting the possible fake Macallan’s aside, Bonhams did have some great bottles feature in their recent sale. 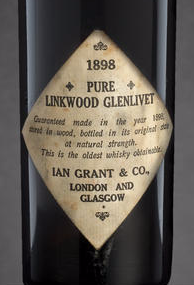 The very first lot was an impressive old 1898 Linkwood. Selling for £2,000 it looked like good value for the buyer being such an ancient relic of a bottle. A bottle of Rare Malts Selection Blair Athol hit a record £300, way past its 2008 price of just £80 and almost double its recent trading range of £150 – £160. Dalmore’s recent good form continued with £600 being the new record for a bottle of 30 year old Stillman’s Dram. A previous high-price of £280 shows this as a significant new peak. Much interest was seen at the top end of the market where a bottle of 50 year old Macallan Lalique sold for £17,000. The last time this sold in the UK (in 2010) it fetched £6,200. Five years later and it’s pushing almost three times that. 1968 appears to have been a good year for Balvenie. Two bottles of that vintage from cask number 7296 sold for £1,300 each. Back in 2008, these were selling for £260 per bottle. Further cementing the collectors credentials of independently bottled silent stills, a Millburn Signatory ‘Silent Stills’ fetched £420, way over its previous best £280. Completing the trio of closed Inverness distilleries; bottles (again Signatory Silent Stills) from Glen Mhor and Glen Albyn both sold for £380 each. Not quite records for either bottle but right at the top of their current trading range. These pages are usually the preserve of some of the rarest bottles of single malt, however, a real showstopper of a blend sold for an incredible £5,500. The early 20th century Johnnie Walker ‘Old Highland Whisky’ is a true piece of history and well deserving of its impressive selling price. Again, the best performances were seen by the oldest bottles or bottles from silent distilleries… and as for those potentially fake Macallan’s I think vigilance is key. Who knows if/when they will emerge on the open market again…. 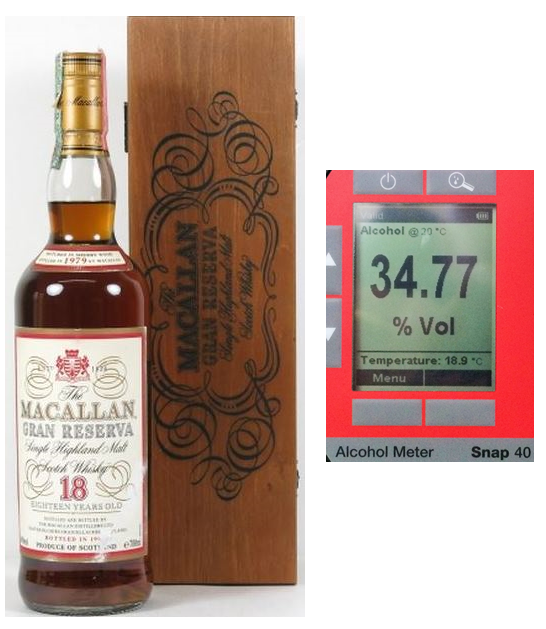 Fake 1979 18 year old Macallan Gran Reserva Alert. Awful as they are, fake bottles of high quality/valuable Scotch whisky are destined to become more prolific as supply on the open market increases… and this one’s a classic – it’s Macallan and it’s relatively high value…. The perfect forgers target. – The gold border on the label is far too wide, the genuine label has a far finer border. 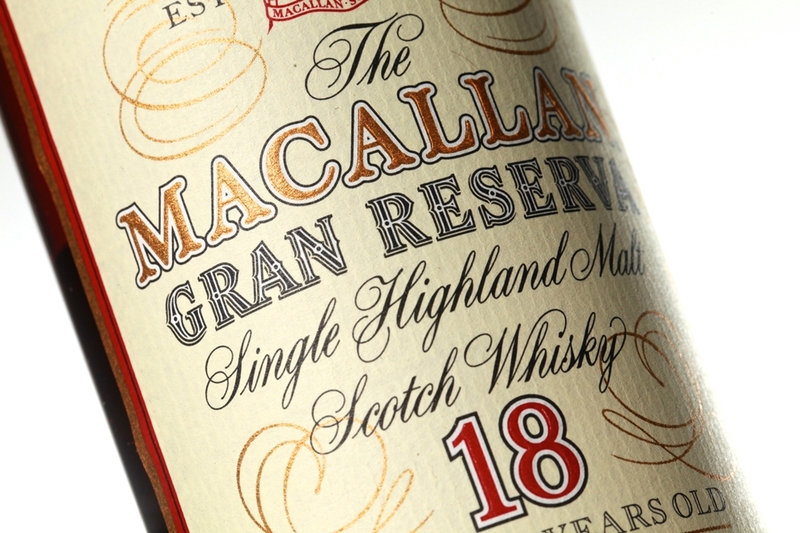 – The gold border (and other detailing) is poorly printed ‘gold’ rather than the bright bronze-powder gold which Macallan used. As with the border, the gold detailing etc on the fake has a really dull lustre to it whereas a genuine bottle is bright. Apparently the genuine labels were a real challenge to produce because of the specialised type of granulated bronze powder paint used. – The texture of the fake label is too flat (and too white). The genuine article has a laid-paper label where you can pick up clear vertical ribbing/ridges in the high quality paper used. – The general colours aren’t as vibrant as with an original bottle. The reds in particular are ‘flatter’ than a genuine bottle. – The rear label has the same issues (gold border is all wrong) and Easter Elchies House looks almost olive green on the fake where it should be cream on an original. Accepting photo’s can be challenging from many perspectives, all told, this one just looks wrong, that’s what drew my attention to it. What’s in it? Probably 10 or 12 year old Macallan… maybe much worse! Who knows… Definitely NOT almost a thousand pounds worth of one of the best Macallans ever released, that’s a certainty. I’ve recently benefited from having physically held one of these fakes alongside the genuine article and the contrast is stark by comparison. That also means this occurrence is not simply a rouge bottle, nor are these fakes solely isolated to the 1979 vintage, other vintages of Gran Reserva are affected too (the one I examined recently was a 1980 vintage). This bottle sold for £960 which is more or less current open market value – collectors and drinkers are being duped by these awful things. I spoke to the auctioneer about this and (being wholly supportive in trying to combat fakes) they immediately agreed to cancel the deal and refund the buyer. I do suspect the bottle will be sent back to the vendor rather than being destroyed, hence trying to raise awareness in spotting the duds. I only hope the vendor destroys it and takes another fake out of the market. Here are some detailed shots of real bottles from a reference perspective. Don’t be duped… Fight those fakes.